Ingredients to promote relaxation are becoming increasingly popular, but the regulatory situation is often tricky. The first functional consumables to enter mainstream American consumer consciousness were energy drinks and power bars, usually loaded with ingredients like caffeine and taurine for high-level, intense functioning. Now, an increasing number of foods and beverages feature ingredients that help consumers go the other way. Relaxation, calmness and stress relief are no longer the sole province of alcohol. Functional foods and beverages are now on the market with ingredients, both old and new, that purportedly help consumers to wind down, escape mental stress and, in some cases, get to sleep. Brian Zapp, creative director with Applied Food Sciences Inc. (www.appliedfoods.com), sees a symmetry between the appeal of energy-enhancing products and the newer surge in products with relaxation appeal. Herbal tea, like Cup of Calm from Traditional Medicinals, is one of the most common applications for calming ingredients. While most functional ingredients are marketed for more established benefits, such as digestive and cardiac health, stress relief is an emerging option, says Santiago Vega, director of marketing, nutrition and health for Naturex North America (www.naturex.com), a unit of Givaudan. Naturex markets stress-relief ingredients including ashwagandha, an herb root sourced mostly from India, melatonin, chamomile, lemon balm and passion flower. These are now mostly used in hot teas and functional beverages, Vega says. Passion flower is an ingredient in Cup of Calm, an herbal tea from Traditional Medicinals (www.traditionalmedicinals.com). Herbal tea is a natural vehicle for relaxation-oriented ingredients, says brand manager John Churchman. “Many consumers naturally associate hot herbal tea with relaxation; it is one of the most sought-after benefits within the category,” Churchman says. Besides passion flower, Cup of Calm features chamomile, lavender and catnip, all of which are classified as “nervines” – herbs that purportedly act on the nervous system to help relieve stress. Kava, consumed in the South Pacific for centuries, is finding its way into foods. Kava is another ingredient primarily marketed as a stress reliever and sleep enhancer. Sometimes called kava kava, it’s the root of a shrub that grows in Hawaii and other South Pacific islands, where it has been consumed for centuries for its calming and soporific effects. Kava is usually consumed as a beverage, but it’s turning up in foods also. Ozia Originals (www.oziaoriginals.com) markets Kava Kava candy, whose carton declares it “The Stress Candy – When nothing else relieves stress at work.” The candy is produced on the U.S. mainland, but the kava is sourced from Hawaii, says Steve George, “village chief” of Ozia Originals. It’s sold mostly online and in bars that specialize in kava drinks – a growing phenomenon in U.S. cities. Another substance often marketed to help with calmness, and especially sleep, is melatonin, a hormone produced by the brain’s pineal gland that regulates sleep cycles. Although scientific evidence of its effectiveness is not conclusive, it’s widely sold in capsule or tablet form in drugstores as a sleep aid. It’s also used in pet food, especially in dog treats that are marketed as having a calming effect on nervous or hyperactive dogs. Its use as an ingredient is less widespread, but it’s present in a number of products that promote themselves as sleep aids -- like Som Sleep, a drink marketed by Som Friends Inc. (www.getsom.com). In addition to melatonin for sleep enhancement, Som Sleep has L-theanine and gamma-aminobutyric acid (GABA), which are often marketed as relaxation-promoting ingredients. Bent says Som was developed through testing with “a select group of professional athletes and celebrities” as well as others. “We were able to garner feedback from those we knew would give us a straight answer on whether Som worked for them and whether they enjoyed it.” Eventually, the company settled on the formula of magnesium and vitamin B6 for nutrition, L-theanine and GABA for relaxation, and melatonin for sleep. Regulations for ingredients such as melatonin make it easier to market products like Som Sleep as supplements instead of beverages. Som Sleep has a light, refreshing, citrusy taste, and Kava Candy is, well, candy. But like many other products with similar ingredients, they both are marketed as dietary supplements, not foods or beverages. This is because of the complicated regulatory situation with ingredients that promote relaxation, which mirrors the situation with functional ingredients in general. Melatonin, for example, is not FDA-approved as a food ingredient; the agency has sent warning letters to food manufacturers using it. Melatonin can currently only be used in nutritional supplements, which operate in a looser regulatory framework. This is why Som is sold as a supplement, Bent says. Using an ingredient not previously determined by the FDA as GRAS (generally recognized as safe) requires ad-hoc FDA permission. Usually, the ingredient supplier will assist with documentation to facilitate that process. Vega says this is easier with certain substances that have an established history of health benefits, such as ashwagandha, which has been used in Ayurvedic medicine for millennia. Products containing CBD, like Hempd flavored waters from Rocky Mountain High Brands, are now legal nationwide. “I think there are several cases in which these materials have been used for a long time, for centuries or more, and the FDA accepts them as safe based on history of use,” Vega says. There’s another category of relaxation-related consumables where regulations are even trickier. 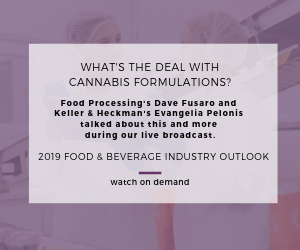 Cannabinoids represent a frontier in food and beverage formulations where the rules, as well as market basics like distribution and consumer demographics, are very much in flux. Cannabinoids fall into two categories. Tetrahydrocannabinol (THC), the psychoactive component of marijuana, is intoxicating when ingested or smoked. It is illegal under federal law, although that law is not currently being enforced in the 30 states that have legalized medical marijuana under state law, or the nine that have legalized its recreational use. In the latter, sales of THC-infused foods and beverages are common. The second cannabinoid ingredient is cannabidiol (CBD), mostly derived from industrial hemp. CBD is not psychoactive, but it is said to promote relaxation and anxiety, and relieve some types of pain. Its legality had been ambiguous, but that ambiguity has mostly been removed with the passage of the Farm Bill, which President Trump signed in December. The bill legalizes industrial hemp and its byproducts nationwide. Michelle Krebsbach, director of marketing for Rocky Mountain High Brands, personally swears by the restorative powers of CBD. She recounted how, sitting at her desk suffering from a “throbbing migraine,” she took two dropperfuls of Hempd tincture. Like many products containing cannabinoids, Hempd is mostly distributed online and in specialty stores. Krebsbach says that with the passage of the Farm Bill, Rocky Mountain High Brands is in a position to move ahead with more retail distribution. Using ingredients that promote relaxation can be tricky, in terms of regulation and other aspects. But the right research and groundwork can go a long way toward…relieving anxiety. Phivida Holdings Inc. is rolling out a line of single-serve functional iced teas.